A Republican senator recently bemoaned there was a "gray cloud over this administration's head," during the first meeting of a House Congressional inquiry into connections between Trump's campaign and the Russians. That gray cloud is turning black after a USA Today investigative report that found 75 pending civilian lawsuits facing the Gropper-In-Chief. Chump claimed that as president he should be immune from defamation lawsuits but that's not the way the Supreme Court sees it. 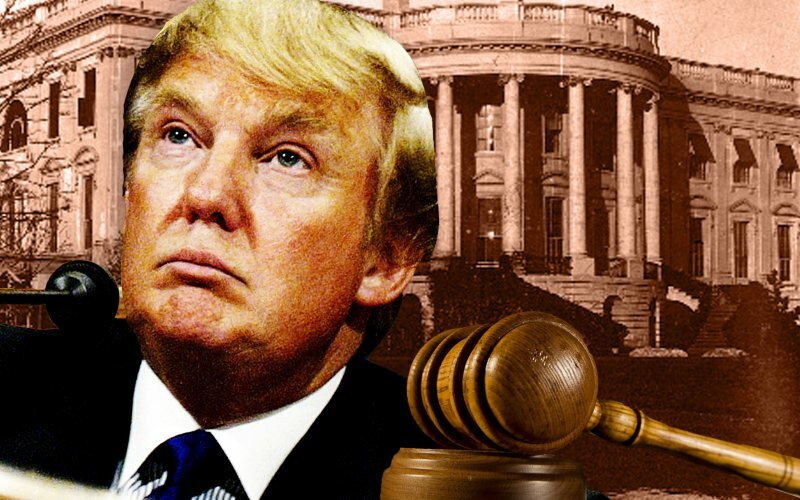 The issue was taken up in Clinton v. Jones and determined unanimously that no man is above the law and that includes the president of the United States. Summer Zervos, a former contestant from The Apprentice, sued Stump in New York on Jan. 17, just days before his inauguration. Hump's best lawyers tried to invoke the Supremacy Clause that immunizes the president from being sued in state court while in office. No one bought that argument. Legal scholars have been warning all along that Rump brings a pile of garbage with him to the presidency that's going to stink up his administration. “Because of the Supreme Court case related to Bill Clinton, there’s no automatic shield for the president from civil action,” Samuel Issacharoff, a law professor at New York University told USA TODAY. You might say Lump has a track record that make his legal eagles seem like skilled horse handicappers after litigating over 4,000 cases in forty years. Can American Taxpayers Afford Trump?